Limited edition archival prints available now in Barebones Gallery. 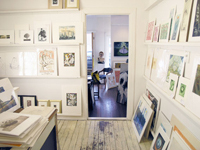 Established 1994, the gallery has a exceptional discerningly curated selection of prints and paintings by local and international artists. Located in Bangalow, a historic village which offers a discreet collection of hip cafes and stylish retail. Well worth the 15 minute drive from Byron Bay. 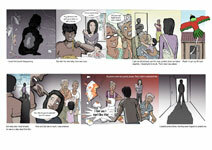 Couple of spreads from Only Human book addressing domestic violence. One of six ‘stories’. Blend of graphic journalism and text accounts; all taken from first person transcripts. The illustrated sections are not only less daunting for those who struggle with a lot of words, but ideally will draw in readers who wouldn’t necessarily pick up a book on this critical issue. 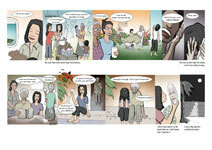 Using colour, shades of grey, and symbolism, the graphic pages can express internal thoughts, as well as the horror and hope that accompanies domestic violence – feelings common to victims and their families, regardless of all social, cultural or economic differences. Pleasure to work on a commission for Ransom Publishing UK. Series of picture books for challenged readers. Challenge of the brief: images that will engage early teens whose literacy skills are basic. Vocabulary was simple, but illustrations needed to be cheeky, cool, inviting; ensuring the readers recognise themselves and don’t feel self-conscious reading a picture book.